Göteborg International Biennial for Contemporary Art (GIBCA) and Röda Sten Konsthall announced the appointment of Elvira Dyangani Ose as curator of the eighth edition of GIBCA. Elvira Dyangani Ose (b. 1974, Spain/Equatorial Guinea) is Curator International Art, supported by Guaranty Trust Bank Plc at Tate Modern. She joined Tate in 2011, taking a leading role in developing Tate’s holdings of art from Africa and its Diaspora and working closely with the Africa Acquisitions Committee. She is responsible for Across the Board (2012–2014), a two-year interdisciplinary project that took place in London, Accra, Douala, and Lagos. She recently co-curated Ibrahim El-Salahi: A Visionary Modernist (2013). Prior to Tate, she was curator at the Centro Atlántico de Arte Moderno (2004–2006) and at the Centro Andaluz de Arte Contemporáneo (2006–2008), where she organized several exhibitions including works by, among others, General Idea, Viennese Actionism, Alfredo Jaar, Lara Almárcegui, Ábalos & Herreros, and Ricardo Basbaum. At the CAAM, she curated the seminal exhibition Olvida Quien Soy / Erase Me From Who I Am (2006), presenting works by, among others, Nicholas Hlobo, Tracey Rose, Moshekwa Langa, Zanele Muholi, and Mikhael Sutbozky. She has curated the retrospective exhibition Carrie Mae Weems: Social Studies (2010) and the interdisciplinary project Attempt to Exhaust an African Place (2007–2008). She was also curator of Arte Invisible (2009–2010), guest curator of the triennial SUD-Salon Urbain de Douala (2010), and the Artistic Director of the third edition of the Rencontres Picha. Lubumbashi Biennial (2013). Dyangani Ose has published and lectured on modern and contemporary African art and contributed to art journals such as Nka and Atlántica. She is currently completing a PhD and holds an MA in History of Art and Visual Studies from Cornell University, New York; an MAS in Theory and History of Architecture from Universitat Politècnica de Catalunya, Barcelona; and a BA in Art History from Universitat Autònoma de Barcelona. 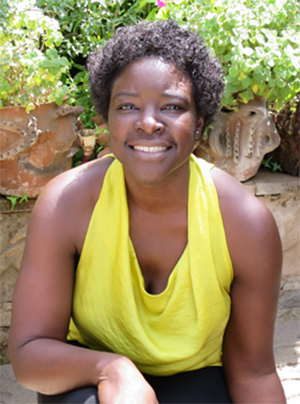 Elvira Dyangani Ose, curator of GIBCA 2015. Courtesy of Independent Curators International.